The first aim of this study has been therefore to disclose the molecular mechanisms underlying CD99 induced cell death, namely to evaluate the involvement of mitochondria and then to identify other crucial players of the process. Another important aspect we have afforded in this study has been the evaluation of the role of mitochondrial DNA (mtDNA) mutations in EWS. Indeed, it has been previously reported that the mtDNA D-loop region exhibits a high frequency of somatic mutations in patients with EWS, suggesting that mtDNA variations may play a role in its development.8 However, only the D-loop fragment was analyzed in this study, adding little to the knowledge that D-loop instability is a common somatic event in cancer. We have previously reported that mtDNA mutations affecting complex I subunits and destroying both its activity and assembly, make cells resistant to apoptosis.9 Moreover, other studies indicate that homoplasmic (100% mutant load) truncating mtDNA mutation confers a less pronounced resistance to oxidative stress-induced cell death compared with heteroplasmic state.10 Hence, a link between the oxidative phosphorylation impairment caused by mtDNA mutations and apoptosis may be envisaged, since the mitochondrion is central to both processes. We have therefore sequenced the whole mitochondrial genome to reveal the presence of mutations in EWS cells and tumors, to attempt a correlation between mtDNA genetic lesions, mutation load, and possibly apoptosis resistance and tumorigenicity. 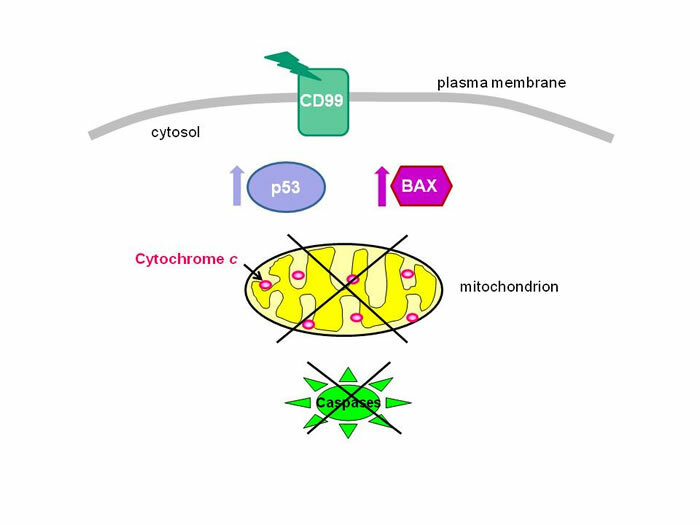 Cell death triggered by CD99 does not involve mitochondria and caspases. The effect of 0662 antibody is very fast, being annexin exposure, a typical hallmark of cell death, already detected after 5min. At the very same time, the levels of the pro-apoptotic Bcl-2 family protein Bax and of phosphorylated p53 were markedly increased. We also observed that increased mRNA Bax levels were associated with decreased amount of the anti-apoptotic protein Bcl-2, in agreement with the opposite effects of these Bcl2-family proteins on the apoptotic cell death. However, the mitochondrial membrane potential (Dym) was maintained and decreased only at longer times, after 15min, i. e. subsequently to Bax and p53 increase. It is noteworthy that, despite the massive and rapid increase in Bax levels and subsequent Dym depolarization, the apoptogenic factor cytochrome c was not released into the cytosol even after a prolonged treatment. Accordingly, electron microscopy analysis of 0662 Mab-treated cells failed to show evidence for nuclear chromatin condensation/fragmentation typical of classical apoptosis. Therefore, as illustrated in Figure 2, CD99 triggering induces a rapid cell death pathway in EWS that clearly involves Bax elevation and p53 signaling, but without release of cytochrome c, thus resulting caspase-independent, in agreement with our previous reports.2 These findings also indicate that the loss of mitochondrial energetic function is a late event and that mitochondria are not directly involved in the triggering of the death process. Autophagy-associated cell death is elicited by CD99 engagement. Autophagy-associated cell death is the most widely studied form of non-apoptotic, caspase-independent death. Autophagy is the process of catabolism of cellular components. It degrades cytosolic contents, including proteins and many types of organelles. During autophagy, organelles and long-lived cargo proteins are encapsulated by a double-membrane structure, known as the autophagosome, that then fuses with lysosomes, generating the autolysosome (see figure 3). The degradation of intracellular components recycles essential biomolecules to provide energy. The different steps of autophagy are mediated/regulated by autophagy-related (Atg) proteins. It is well known that autophagy plays a dual role in cells: it can enhance survival in response to nutrient deprivation, organelle damage and stress, or result in death when sustained for prolonged time.11 This type of cell death occurs without DNA fragmentation, nuclear collapse or cytoplasmic shrinkage and death is the result of excessive engulfment and subsequent self-digestion. 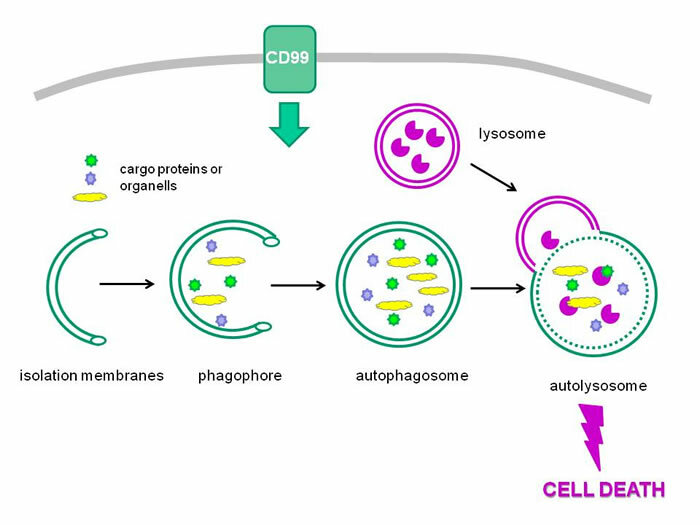 Given that autophagy has recently been implicated in cell death mediated by p53-dependent mechanisms, we asked whether CD99 engagement in EWS cells by 0662 Mab might exhibit typical features of autophagy. Combined analysis by electron microscopy, immunofluorescence and western blotting allowed us to clearly demonstrate that CD99 engagement in EWS cells results in a caspase-independent cell death mechanism, with some features of autophagy. The identification of autophagic features in the cell death mechanism triggered by CD99 activation is potentially very important, suggesting relevant targets for development of future treatments. The whole sequencing of mtDNA of 11 cell lines generated at the Rizzoli Institute from EWS and 15 osteosarcoma cell lines was carried out, in order to reveal occurrence of pathogenic mutations. We detected homoplasmic genetic variants in the MT-ND1, MT-CYTB and MT-COIII genes in one EWS line, which were not predicted per se to be pathogenic and yet an overall haplotype role in determining a bioenergetic impairment may not be completely ruled out until functional studies. Interestingly, a heteroplasmic mutation in MT-ND5 gene was also detected in the U2OS cell line (osteosarcoma). To assess whether these mutations affected the mitochondrial energetic function, we measured the ability of these cells to grow in a glucose-free medium containing galactose, i.e. where the rate of glycolysis is strongly reduced and cells are forced to rely on oxidative phosphorylation only for energy production. Under these conditions, cells with defective oxidative phosphorylation are unable to survive in galactose medium. We observed that both the two cells lines bearing the mtDNA mutations did grow nicely under these conditions. Furthermore, the efficiency of oxidative phosphorylation was not significantly different with control cell lines. There results indicate that the genetic variants in mtDNA identified in the two cell lines did not cause a functional dysfunction. The surely pathogenic mutation in U2OS did not have any effect on OXPHOS efficiency likely because of its heteroplasmic status. It has been in fact shown that disruptive mutations in complex I such as this one ought to reach a specific mutation threshold in order to display a pathogenic phenotype, since they ablate the subunit synthesis and may not act as dominant negative. The mutation we detected in U2OS was in fact below the predicted threshold for a phenotypic effect and it remains interesting to know whether such a mutation was also present in the tumour from which the cell line originated, and at what heteroplasmy degree. Unfortunately this was not a feasible task, although future studies may shed light on the occurrence of certain pathogenic variants in osteosarcomas. High frequency of somatic mutations and germline polymorphisms in the mtDNA D-loop region in EWS tumors has been previously reported,8 suggesting that these mtDNA variations may play a role in the development of EWS. Moreover, our finding in U2OS cells especially, prompted us to shift to in vivo analysis of the mtDNA genotype. We have therefore sequenced the full length mtDNA of 4 EWS specimens available at the Rizzoli Institute. This number was chosen as the minimum for a preliminary analysis, given that these biopsies are very precious, due to the known difficulties to obtain specimens from these lesions in patients. No pathogenic mutations were found in these samples, neither in hetero- nor in homoplasmy. Therefore even if mutations could be found in the non-coding D-loop, no evidence for mutations occurring in the coding regions was obtained in EWS. Recently, Yu et al. reported the occurrence of somatic mutations in the coding regions of the mitochondrial genome, with a total number of 11 mutations over 31 patients with osteosarcomas, most of them (55% ) were within the D-loop region.12 Some of these mutations were predicted to be functionally relevant mutations in tRNA and polypeptide-coding genes with potential detrimental impacts on the mitochondrial OXPHOS system. However all these mutations were heteroplasmic (ranging between 35-80%), likely below the threshold for dysfunctional phenotype and their pathogenic role in tumor development is questionable. In conclusion, the analysis performed both in both cell lines and specimens tends to rule out a significant role for mtDNA mutations in the pathogenetic mechanisms of EWS development. 1. Rocchi A, Manara MC, Sciandra M, Zambelli D, Nardi F, et al. (2012) CD99 inhibits neural differentiation of human Ewing sarcoma cells and thereby contributes to oncogenesis. J Clin Invest 120: 668-680. 2. Cerisano V, Aalto Y, Perdichizzi S, Bernard G, Manara MC, et al. (2004) Molecular mechanisms of CD99-induced caspase-independent cell death and cell-cell adhesion in Ewing's sarcoma cells: actin and zyxin as key intracellular mediators. Oncogene 23: 5664-5674. 3. Scotlandi K, Baldini N, Cerisano V, Manara MC, Benini S, et al. (2000) CD99 engagement: an effective therapeutic strategy for Ewing tumors. Cancer Res 60: 5134-5142. 4. Sohn HW, Choi EY, Kim SH, Lee IS, Chung DH, et al. (1998) Engagement of CD99 induces apoptosis through a calcineurin-independent pathway in Ewing's sarcoma cells. Am J Pathol 153: 1937-1945. 5. Wang C, Youle RJ (2009) The role of mitochondria in apoptosis. Annu Rev Genet 43: 95-118. 6. Pettersen RD, Bernard G, Olafsen MK, Pourtein M, Lie SO (2001) CD99 signals caspase-independent T cell death. J Immunol 166: 4931-4942. 7. Chatterjee A, Mambo E, Sidransky D (2006) Mitochondrial DNA mutations in human cancer. Oncogene 25: 4663-4674. 8. Yu M, Wan Y, Zou Q, Xi Y (2009) High frequency of mitochondrial DNA D-loop mutations in Ewing's sarcoma. Biochem Biophys Res Commun 390: 447-450. 9. Porcelli AM, Ghelli A, Ceccarelli C, Lang M, Cenacchi G, et al. The genetic and metabolic signature of oncocytic transformation implicates HIF1alpha destabilization. Hum Mol Genet 19: 1019-1032. 10. Park JS, Sharma LK, Li H, Xiang R, Holstein D, et al. (2009) A heteroplasmic, not homoplasmic, mitochondrial DNA mutation promotes tumorigenesis via alteration in reactive oxygen species generation and apoptosis. Hum Mol Genet 18: 1578-1589. 11. Kimmelman AC (2011) The dynamic nature of autophagy in cancer. Genes Dev. 25:1999-2010. 12. Yu M, Wan Y, Zou Q (2013) Somatic mutations of the mitochondrial genome in Chinese patients with Ewing sarcoma. Hum Pathol. 44:1350-6. .
V10N4 ESUN Copyright © 2013 Liddy Shriver Sarcoma Initiative. CD99 is a cell surface transmembrane protein highly expressed in all Ewing’s sarcomas (EWS). Engagement by anti-CD99 monoclonal antibodies induces massive apoptosis and reduces malignant potential of EWS cells, through a caspase-independent mechanism whose molecular features are still elusive.1 Most recently expression of CD99 was found to modulate migration and metastatic ability of EWS.2 In addition, the engagement of CD99 increases sensitivity to conventional chemotherapeutic agents and induces tumor regression and significant delay and reduction in metastatization.3 As a consequence understanding the molecular mechanisms underlying CD99 induced cell death is mandatory, since it may reveal new molecular therapeutic targets of general interest. In addition a better understanding of the apoptotic mechanisms may be helpful for intensifying effects of conventional therapy limiting high doses of chemotherapy and sparing toxicity. Apoptosis is an evolutionary conserved type of cell death mechanism that governs body tissues homeostasis. This self-demise mechanism allows for removal of damaged or unwanted cells, so that the whole organism improves its survival. It is widely accepted that deregulation of apoptosis can lead to cancer and neurodegenerative diseases. The crucial event of the process is the activation of caspases, a group of proteases that can cleave intracellular proteins, dismantling the cell content. There are two major pathways of apoptotic cell death: the extrinsic, activated by ligation of extracellular signals to trans-membrane death receptors, and intrinsic, also called the mitochondrial pathway owing to the essential involvement of these organelles. Caspase-independent types of cell death have also been described. A lesson learned for other neoplasms is that biologically disparate entities need subtype-specific treatments and therapy needs to be designed in a disease-specific fashion according to the underlying biology. However rarity of sarcoma frequently couples with rarity of the target (CD99), making development of new, targeted drugs even less probable. Determining if it is possible to deliver massive apoptosis of EWS cells by using drugs already available is the final translational goal of this project, so to overcome the high-costs required for development of new agents. This possibility is based on deep molecular knowledge of CD99-related signaling. 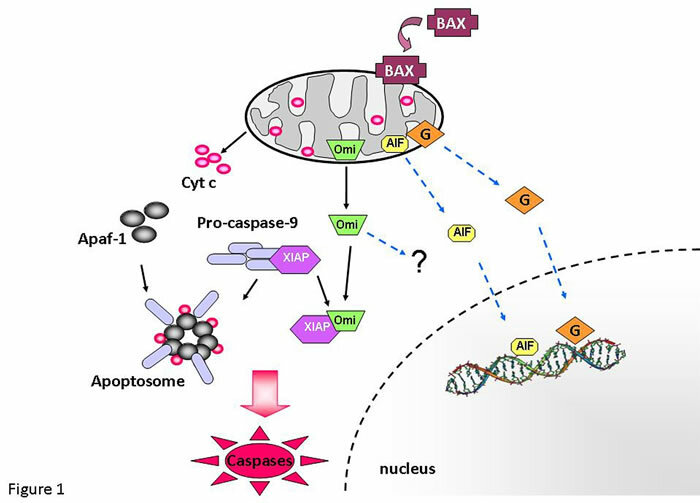 Among them, cytochrome c can be released from mitochondria into the cytoplasm driving the assembly of the apoptosome, which in turn triggers activation of caspase-9 and downstream executioner caspases in the "classical" caspase-dependent apoptosis. Apoptosis inducing factor (AIF) and Omi/HtrA2 are other mitochondrial apoptogenic factors involved in caspase-independent apoptotic pathways.7,8 Given that caspases seem not to be primarily involved in CD99-triggered cell death, further studies are clearly required to identify the apoptogenic factors involved in the process. These mutations are often homoplasmic, suggesting the existence of a positive selection of mutant mtDNA copies during tumor progression, a process that has yet to find explanation. Interestingly, Yu et al., 2009, reported that the mtDNA D-loop region exhibits a high frequency of somatic mutations in patients with EWS, suggesting that mtDNA variations may play a role in development of EWS.16 In this study, only the D-loop fragment was analyzed, adding little to the knowledge that D-loop instability is a common somatic event in cancer. This issue deserves further studies focused on whole mitochondrial genome sequencing, heteroplasmy mutations level evaluation and assessment of their pathogenic potential, to better understand the functional implications of mtDNA instability in EWS. Given that Bax levels have been shown by us to increase within the first minutes of 0662 incubation, we will determine its activation by using a specific antibody for activated Bax, by IF analysis and western blotting. Cleavage of the BH3-only protein Bid will also be tested in cellular lysates by western blotting, given that caspase-8 activation has been recently reported after ligation of D4, the mouse homologue of CD99.19 Finally to elucidate the mechanism of caspase-independent apoptotic cell death we will measure the release of AIF and Omi/Htr2A, as well as of cytochrome c, from mitochondria to cytosol, as previously described.20 Silencing of AIF and incubation with the Omi/Htr2A inhibitor will be used to verify whether these proteins are required for CD99-activation triggered cell death. Mitochondrial genome sequencing, evaluation of mutations heteroplasmy and of their pathogenic potential will be performed in EWs cell lines and tumors, as previously described.22 Briefly, DNA will be extracted from tumor tissues and cells with commercial kits (Qiagen). The MitoAll re-sequencing kit (Applied Biosystems) will be used to screen for mtDNA mutations upon assembly of the 46 amplicons through the SeqScape software optimized to this purpose (Applied Biosystems). A thorough analysis of the entire mtDNA sequence obtained will be performed in terms of reconstruction of the mitochondrial haplogroup/haplotype, in silico prediction of variants pathogenicity as well as variability data on the rare variants detected, via the implementation of HmtDB algorithms, available to the proponent through a collaboration with the creators of the HmtDB database, as previously described.23 Heteroplasmy evaluation and quantification will be performed with optimized methods available at the Unit of Medical Genetics such as DHPLC and fluorescent PCR for small insertions and deletions. A panel of 22 cell lines (including all the most commonly used EWS cell lines and primary cell cultures established in our lab) will be screened for the presence of mtDNA mutations by sequencing, as described above. Data will be compared with those obtained in clinical samples (see below). It is noteworthy that preliminary experiments revealed mtDNA mutations in 2 out of the 8 cell lines analyzed so far. Pivotal analysis will also be performed on 20 biopsy and 20 tumor speciments after preoperative chemotherapy, to verify the presence of mitochondrial mutations in untreated tumors and after exposure to standard chemotherapy treatments. A tissue array for EWS samples including more than 200 cases is already available at the Rizzoli Institute and may be used for complementary studies to mtDNA sequencing. In selected samples, IHC analysis will be carried out using antibodies for both mitochondria- and nucleus-coded subunits of the five oxidative phosphorylation complexes,23 to gain insight on their assembly status. Moreover, in the very same samples IHC analysis will be performed also for HIF1α. Whenever possible, IHC findings will be correlated with the tumor specific mitochondrial genotype. If encouraging results are obtained we will analyze all the samples available in the Rizzoli biobank to allow associations with patient prognosis. Definition of the molecular mechanisms of CD99-induced apoptosis will identify more common therapeutic targets, for which drugs may be developed and become available. In particular, a more precise and detailed knowledge of the apoptotic mechanisms will help combined therapies with targeted drugs and conventional chemotherapy. Furthermore, exploring mDNA mutations will provide novel findings that may be used as predictors of prognosis and help stratifying patients at diagnosis based on risks, also in relationship with HIF-1α stabilization. Functional in vitro studies will validate correlative clinical analysis and provide indications on molecular mechanisms, thus facilitating the design of more efficient and personalized therapies. 1. Cerisano V, Aalto Y, Perdichizzi S, Bernard G, Manara MC, et al. (2004) Molecular mechanisms of CD99-induced caspase-independent cell death and cell-cell adhesion in Ewing's sarcoma cells: actin and zyxin as key intracellular mediators. Oncogene 23: 5664-5674. 2. Rocchi A, Manara MC, Sciandra M, Zambelli D, Nardi F, et al. CD99 inhibits neural differentiation of human Ewing sarcoma cells and thereby contributes to oncogenesis. J Clin Invest 120: 668-680. 5. Pettersen RD, Bernard G, Olafsen MK, Pourtein M, Lie SO (2001) CD99 signals caspase-independent T cell death. J Immunol 166: 4931-4942. 6. Wang C, Youle RJ (2009) The role of mitochondria in apoptosis*. Annu Rev Genet 43: 95-118. 7. Modjtahedi N, Giordanetto F, Madeo F, Kroemer G (2006) Apoptosis-inducing factor: vital and lethal. Trends Cell Biol 16: 264-272. 8. Suzuki Y, Imai Y, Nakayama H, Takahashi K, Takio K, et al. (2001) A serine protease, HtrA2, is released from the mitochondria and interacts with XIAP, inducing cell death. Mol Cell 8: 613-621. 9. Shidara Y, Yamagata K, Kanamori T, Nakano K, Kwong JQ, et al. (2005) Positive contribution of pathogenic mutations in the mitochondrial genome to the promotion of cancer by prevention from apoptosis. Cancer Res 65: 1655-1663. 10. Kwong JQ, Henning MS, Starkov AA, Manfredi G (2007) The mitochondrial respiratory chain is a modulator of apoptosis. J Cell Biol 179: 1163-1177. 11. Ghelli A, Zanna C, Porcelli AM, Schapira AH, Martinuzzi A, et al. (2003) Leber's hereditary optic neuropathy (LHON) pathogenic mutations induce mitochondrial-dependent apoptotic death in transmitochondrial cells incubated with galactose medium. J Biol Chem 278: 4145-4150. 12. Park JS, Sharma LK, Li H, Xiang R, Holstein D, et al. (2009) A heteroplasmic, not homoplasmic, mitochondrial DNA mutation promotes tumorigenesis via alteration in reactive oxygen species generation and apoptosis. Hum Mol Genet 18: 1578-1589. 13. Chatterjee A, Mambo E, Sidransky D (2006) Mitochondrial DNA mutations in human cancer. Oncogene 25: 4663-4674. 14. Bonora E, Porcelli AM, Gasparre G, Biondi A, Ghelli A, et al. (2006) Defective oxidative phosphorylation in thyroid oncocytic carcinoma is associated with pathogenic mitochondrial DNA mutations affecting complexes I and III. Cancer Res 66: 6087-6096. 15. Gasparre G, Hervouet E, de Laplanche E, Demont J, Pennisi LF, et al. (2008) Clonal expansion of mutated mitochondrial DNA is associated with tumor formation and complex I deficiency in the benign renal oncocytoma. Hum Mol Genet 17: 986-995. 16. Yu M, Wan Y, Zou Q, Xi Y (2009) High frequency of mitochondrial DNA D-loop mutations in Ewing's sarcoma. Biochem Biophys Res Commun 390: 447-450. 17. Porcelli AM, Angelin A, Ghelli A, Mariani E, Martinuzzi A, et al. (2009) Respiratory complex I dysfunction due to mitochondrial DNA mutations shifts the voltage threshold for opening of the permeability transition pore toward resting levels. J Biol Chem 284: 2045-2052. 18. Riggi N, Suva ML, Stamenkovic I (2009) Ewing's sarcoma origin: from duel to duality. Expert Rev Anticancer Ther 9: 1025-1030. 19. Park HJ, Ban YL, Byun D, Park SH, Jung KC Interaction between the mouse homologue of CD99 and its ligand PILR as a mechanism of T cell receptor-independent thymocyte apoptosis. Exp Mol Med 42: 353-365. 20. Porcelli AM, Ghelli A, Iommarini L, Mariani E, Hoque M, et al. (2008) The antioxidant function of Bcl-2 preserves cytoskeletal stability of cells with defective respiratory complex I. Cell Mol Life Sci 65: 2943-2951. 21. Boya P, Andreau K, Poncet D, Zamzami N, Perfettini JL, et al. (2003) Lysosomal membrane permeabilization induces cell death in a mitochondrion-dependent fashion. J Exp Med 197: 1323-1334. 22. Gasparre G, Porcelli AM, Bonora E, Pennisi LF, Toller M, et al. 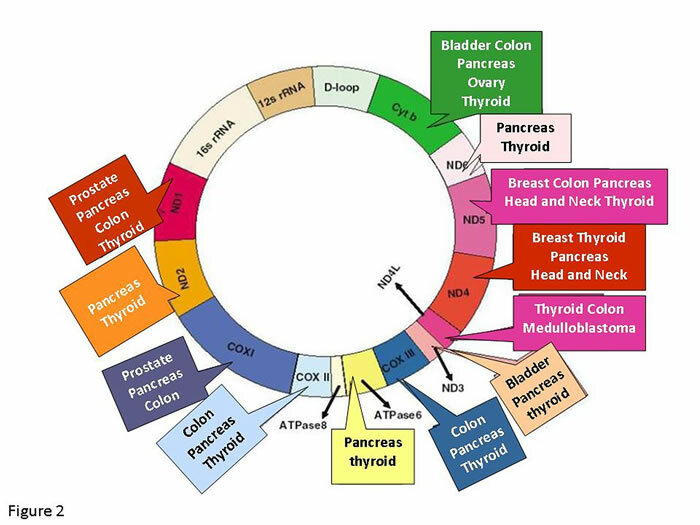 (2007) Disruptive mitochondrial DNA mutations in complex I subunits are markers of oncocytic phenotype in thyroid tumors. Proc Natl Acad Sci U S A 104: 9001-9006. 23. Porcelli AM, Ghelli A, Ceccarelli C, Lang M, Cenacchi G, et al. The genetic and metabolic signature of oncocytic transformation implicates HIF1alpha destabilization. Hum Mol Genet 19: 1019-1032. 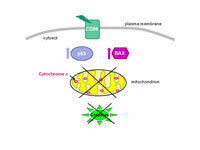 Upon apoptotic signalling and translocation of pro-apoptotic Bcl-2 family proteins, such as Bax, to the mitochondrial outer membrane, some apoptogenic factors (cytochrome c, Omi/Htr2A, AIF, endonuclease G, etc), which are normally sequestered within the mitochondrial intermembrane space, can be released into the cytosol following permeabilization of the outer membrane. In the cytosol, cytochrome c can bind to Apaf-1 to induce apoptosome formation, leading to caspase activation. Omi/Htr2A can bind to XIAP to remove its inhibitory effect on caspase-9. As a serine protease, Omi/Htr2A can also activate caspase-independent cell death through an still unknown mechanism. AIF and endonuclease G (G), probably after further processing, are also released in the cytosol and can then enter into the nucleus where they promote nuclear DNA fragmentation, independent of caspase activation. Caspase-dependent pathways are depicted as filled black arrows, caspase independent pathways are represented as dotted blue arrows. Mitochondria possess a double stranded genome capable of transcription, translation and protein assembly, independent of the nucleus. 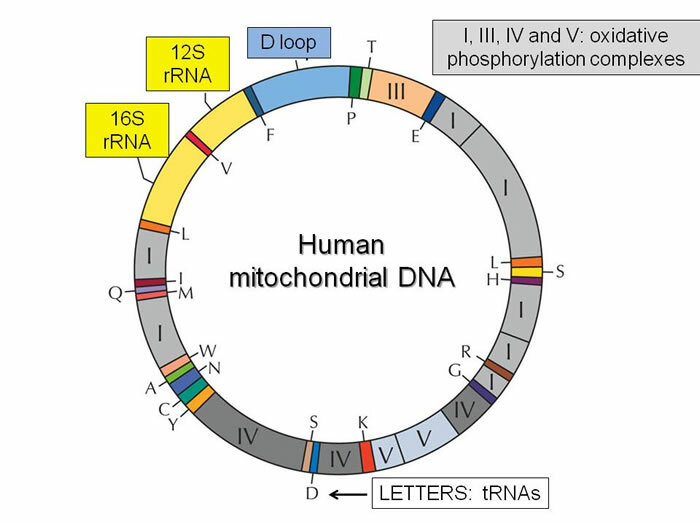 Human mtDNA is a 16.6 kb circular molecule, represented at a high copy number per cell, encoding for 13 polypeptides involved in oxidative phosphorylation, 2 rRNAs and 22 tRNAs, essential for protein synthesis within mitochondria. The most common mtDNA mutations identified in various types of human cancer are shown (modified from ref. 13). 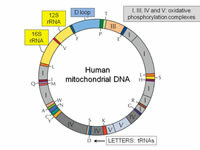 The mitochondrial DNA (mtDNA) is a circular chromosome containing about 16,568 base pairs, coding for 37 genes, two are for the 12 and 16S subunits of ribosomal RNA (rRNA), 22 are for transfer RNA (tRNA) for aminoacids (indicated in capital letters) and 13 are for proteins (subunits of complexes I, III, IV and V of the oxidative phosphorylation, indicated in roman letters). The D loop, the displacement loop region, is associated with initiation of DNA replication. Addition of 0662 antibody to EWS cells induced CD99 activation and p53 phosphorylation. In parallel, the level and the mitochondrial membrane translocation of the pro-apoptotic Bcl-2 family protein Bax also increased. However, the apoptogenic factor cytochrome c, which is normally sequestered within the mitochondrial intermembrane space, was not released into the cytosol. Accordingly, Apaf-1 cannot assemble the apoptosome and caspases are not activated. Autophagy is an evolutionary conserved mechanism for sequestration of damaged organelles and long-lived cargo proteins into a double-membrane and subsequent degradation. The newly formed double membrane, known as an isolation membrane, surrounds cytosolic cargo and the edges seal to sequester the content into the autophagosome. Autophagosome then fuses with lysosomes, allowing degradation of the cargo and recycling back into the cytosol the basic biomolecules. 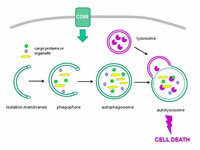 Although autophagy can in general contribute to cell survival, in some settings it cannot support cell survival leading to irreversible cell death, as in the case of CD99 activation by 0662 antibody in EWS cells. V8N2 ESUN Copyright © 2011 Liddy Shriver Sarcoma Initiative. The Liddy Shriver Sarcoma Initiative funded this $50,000 research grant in April 2011. The study was made possible by generous donations made in memory of Michael Lio (Strike out Sarcoma), Peter Skelton (Peter Skelton Sarcoma Research Foundation), Ryan Glenny, Paul Roth, Mike Homan, Craig Goris, Richard Pollak, and Joe Rivas, who lost their lives to Ewing's sarcoma; and by generous donations made to honor Jeremy Weingrod and Alex Franke, who are fighting the disease. The University of Bologna and the Rizzoli Institute published announcements about this grant.